My question is really quite simple, I would like some helpful hints on how to get out there (into the dating scene). I think the main problem is I am so secretive about my personal life, I almost feel angry when someone continues to pursue a question even further. I like to keep to myself and sharing with someone else absolutely terrifies me. They don’t need to know what happened in the past, all they need to know is that I like to eat take out chinese and watch a movie. I’m so afraid to have someone really get to know me … they may not like what they see. I can be kind of intense and too serious for people. Venus conjunct Pluto: You’re terrified of intimacy, all too aware of the potential for abuse and manipulation in relationships. I’d venture to guess that you’ve been traumatized, and that you don’t feel safe exposing your secrets to a near-stranger. There’s no way to honestly talk about your past without acknowledging your hurt, so you’d rather avoid discussing it all together. Saturn in Leo: Not feeling special, fear of being seen. (The emperor has no clothes?) All the more harmful since it’s in your 12th House of Self-Undoing. The most elevated planet in your chart is your Moon in Gemini. You feel comfortable being superficial (take-out and a movie), yet how long can you stay on the surface in the dating world? You just completed your Saturn Return, when transiting Saturn returns to its original position when you were born. Your natal Saturn rules your Fifth House of Romance, so it makes sense that you’re taking this area of your life seriously. In other words, you’re nearly 30 and single, and you’re not getting any younger. You want a relationship, yet your terror of being seen as worthless or bad is sabotaging your dating success. After a Saturn Return, single people are most likely looking to settle down and start a family, not just casually date — for Saturn is the planet of mortality and responsibility. If you’re too guarded, a date won’t know if he wants to get to know you further. He’ll wonder what you’re hiding, or assume that you’re shutting him out because you don’t like him. Your “dating planets” are in outgoing signs (Venus in Libra, Mars in Leo), so you probably have the flirtatious/seductive thing down (especially with Venus conjunct Pluto!). I don’t think you need to know so much “how to get out there,” as “how to get over your self-hatred and fear of being destroyed.” That, my dear, requires a psychotherapist, not a dating coach. Dear Scorp I think you need to learn to trust yourself and open up. Do you give sessions over the phone? Haha just kidding. Thank you for your prompt response. I think what you wrote made a lot of sense. Although, I must say, Jeffrey easier said than done. I don’t hate myself though. I don’t like some things about myself, but that is the way my world works. I will forever be trying to improve myself. I realize that “perfect” is relative, but I have come to the conclusion that I can a least search for satisfaction and contentment. I think I will always be striving for the highest ideal. . .habit I suppose. 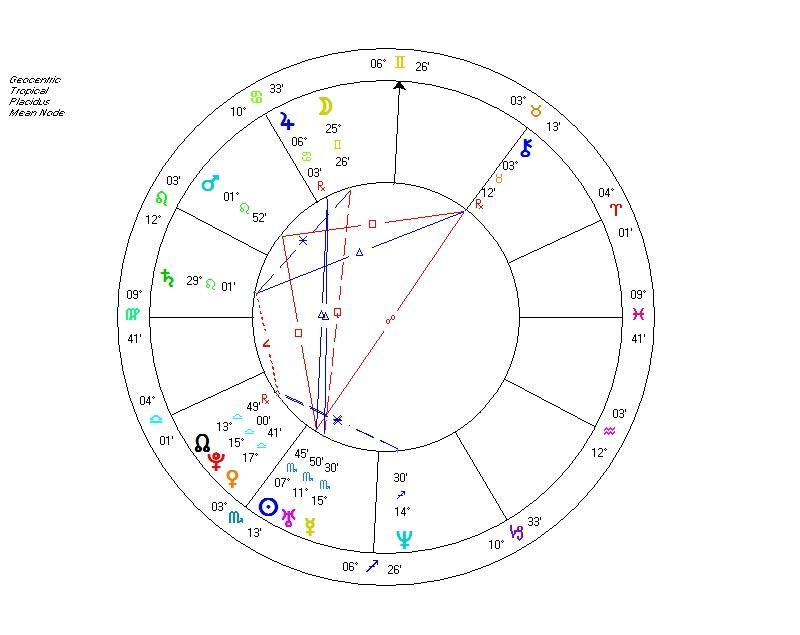 @Sharon (Scorpio), you are welcome to link to resources such as where to get a free progressed chart. @Stacie, As a matter of fact, I do do phone readings! Wow this takes the words right out of my mouth. I feel exactly the same.. it really frustrates me. I constantly feel like people won’t like me once they get to know me, because i can be a little crazy and intense sometimes, in a lot of different ways. It’s kind of hard to explain. I find myself very uncomfortable when people are asking even simple, normal or general sort of ‘get to know you’ questions. I dont know why. Hmm..
Reading this thread answers a few of my own questions about being a shy scorpio, thanks for the insight. I have to say for myself that I would rather run away from possible relationships than face any embarressing questions that might come up and I’m ashamed to say this is why at the age of 25 I’ve never had a boyfriend. Fear of peoples reactions and gossip makes it so hard to share anything! ive seen a scorpio twice after having phone txt conversations. we made, in his words, intense love 2nd date. returning home he asked if i were interested in seeing him more. i am and told him so. he said thats what he wanted to hear… i made a call to him and he didnt return it… txt’d me 3 days later. very discrete in my opinion and i dont know if i should be complemented or cautious. he says he’s thinkin of me too. any thoughts? I too am talking a lot with someone who is a shy scorpio and worries about what others think way too much. We both work at the same facility and it is what seems to be the problem. He likes me and I like him, he’s just afraid of the rumors and crap he’ll get from people. Me I’m a virgo and dont’ really care what others say. I’ve learned that walking away from him and not acting as if I’m soo interested really makes him come after me. I see his smile and those darn intreging eyes and I’m done for. I think this will be a slow relationship, but will definitely get somewhere. It will take my patience and understanding. ok after reading this i definatly haft to check out charts. Now im wholley interested. OMG. This totally described me! Interesting! I have some similar things in my chart and I can relate to some of the things. Like being scared to get out there and knowing how bad it feels to be hurt plus not feeling worthy of love. we as people need to stop equating love to a two person partnership. when we do that we reall depreciate love. love/god is so much greater then two people. love is everywhere and in everything. companionship is really lovely but it is not the depth of love. When I saw this topic it instantly reminded me of my boyfriend. I kind of giggled. Most people think of Scorpio as a very confident sign. In my experience Scorpios are pretty reserved when it comes to meet new people. They’re considerably shy and don’t do well in crowds of people. They’re amazing creatures, though. Well worth the extra effort to get to know them. This is all really intriguing. I’m a scorpio with a virgo moon and gemini rising and I’m terribly shy, I lack self confidence ,and I’m definitely always nervous. Though I have a side to me that isn’t so shy.hee hee. I’m also secretive except with people who I feel that I can trust not to judge me. I’m extremely self critical and I’m very aware of human nature. I do however like to get out and go to parties and fun places. (c: It’s nice to know that I’m not entirely alone in being like this. Why the Hell am I feeling my scorpio friend ! so much at the moment ! Amanda were either you are and many will know we fell out when i did not want sexual contact with her as a female, but loved her so much wanted her like a sister , we were so alike we mirrored each other , all was well till I let a Aqua Lesbian befriend me! who took advantage of me to get close to my scorpio friend ! iknowing me and she were having difficulty with our emotions to each other! n the end the aqua turning me into a enemy and becoming my scorpio friends best friend. im not totally naive to the fact that the scorpio most likely threw a sting in there also, because i would not be with her that way but t i still forgive her because i understand how the scorpio mind work’s . like Cancer water signs if they love you sometimes take a revenge attack approach on the ones they love only to regret later, but it’s only because they love you so much , its sort of their way of saying ! look lm gonna inflict this pain on you so you can feel how it feels for me inside loving you… if that makes sense, bit twisted and backward but true. I saw him the other nite went to his place to meet him and he’s wife ,it was weird he now looks like a woman nose , eyes, hairline and chin , its all changed, could not get my head around it…. and even his name is now a woman s name,.being a cancerian im very loyal stand by all who love or hurt me , as i know god forgives all! i believe it makes you grow much bigger and taller …. and free’s your heart and soul . as i know many who never move on happily because they leave behind so many unfinished stories…it comes full circle anyway all life is a revolving experience meeting the same folk over and over in different worlds! like a re-carnation!! I wake up feeling a wave of something like lust but kinda different… its like she maybe is thinking of me. don’t know has anyone experienced this and what do I do ? i don’t want to call her, 1 . because i want to forget the pain she inflected upon me , and too , because she is probably happy .. with this girl she ran away from me with! I don’t want to be laughed at anymore…. or for her to think or still want something or miss her!! its stupid….. we never even had a fight!! never . she just started hating me or so I heard! and gave me a lashing down by text .. but we never had a fight.. all communication was via gossip and her friend saying i talked about her , after this lesbian slept with her ! I know it was the Aqua who filled her head with lies about me , as the above is known scorpios do not trust!! … I want her to find out she was lied to of course… but how can you tell a fixed sign they were lied to , especially scorpio’s they are so stubborn..Just a question did you say this and this , and then i could have cleared the b/s up…. Months on and I still cannot believe scorpio women can be so stupid , its starring you in the face… are scorpio women stupid in love or what ? i was her guardian protector!! … wanted life friendship and never ever would or do I talk behind friends or anyones back as such , im very much out there with my option’s/.. i thought she knew me ..WTF… is this.? is she even doubting her mistake? SCORPIO GIRL’S !!! Don’t you want honesty… or do you prefer liar’s ..
Alright, I am seeing a very shy Scorpio man…he NEVER talks about his private life. I know he is divorced, has kids, 1 under 18, and for some reason we never see each other on the weekends…I am “guessing” it’s because he has the youngest then, plus his middle son lives with him…he answers my questions, but I have to admit I really don’t like to pry and at this early stage, won’t ask a lot of nosey questions. He is awesome in bed, very giving. I want more from him but unsure if I should just tell him I would like to see a little more of him…or let it develop naturally. I think my Aquarian nature intimidates him just a little. He’s very sweet, and we get along well, just don’t know much about him at all… and of course as an Aquarian I am pretty much an open book. Any thoughts on this?? Well this explains everything! i wonder why my brother, who is a Scorpio is extremely shy, especially to his girl classmates in school. Thanks a lot! I’m pretty unapproachable because of how quiet I am. Looking for a Bubbly Betty you won’t find it here. Have been told by many guys they were put off by my shyness at first, till they got to know me and were glad they hung in there and found out the truly enjoyable person that I am which resulted in longlasting friendships. We do like to have fun, talk and laugh, just being reserved is our nature. Some can’t handle this, always thinks we’re hiding something, and it drives them crazy. Ask me anything and I’ll tell you, don’t ask and I won’t tell you. I’m a Gemini with Scorpio Rising. The “chatty” Gemini thing never fit me because I have always been extremely shy unless around people I connect with or trust (far and few between). I can see now that the Scorpio influence contributes to my shyness. Sure Scorpio can be sexually seductive, but when it comes to being emotionally vulnerable… that’s scary.